Readers will be hooked from the opening lines with the descriptive powers of Robert Knot. The characters are often wonderfully described and on occasion so is the setting. The narrative moves as fast as a gunslinger’s hands in a corral fight, leaving readers dizzy as they whip through the back and forth dialogue that makes up the majority of the tale. This is also one of the book’s greatest weaknesses. The dialogue ends up clipped, and there’s little opportunity for a character to catch his breath except when a scene heats up for romance. Better dialogue tags would be useful. There is a lot of “he said” “she said” and “I said,” and not enough nonverbal or body language throughout so that the characters seem to be talking in a white space with nothing going on around them. In the opening two chapters (both entirely in italics, which is a nuisance to read) a woman races for her life through the woods in the dream of a man named Roger Messenger, a Denver policeman looking for his wife’s murderer. Small and expected plot twists occur along the way. The Denver policeman is Robert Messenger, and the woman he dreams about is his wife. 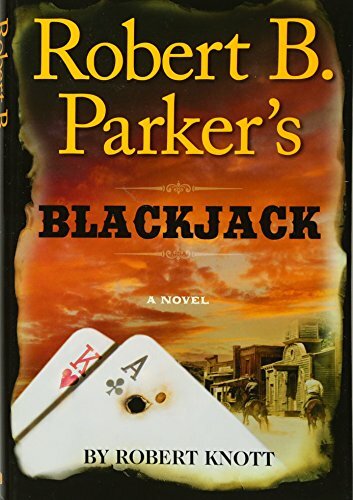 This is number four in the Cole and Hitch series, originated by Robert B. Parker and continued after his death by Robert Knott. Readers won’t need to have read the earlier books for backstory. Readers will root for the good and boo as the bad enter stage left. At the center of the story is a murder mystery involving Boston Bill Black and Sgt. Messenger’s wife. The case seems clear cut, and the whodunit is easy enough to figure out, but there is more than meets the eye, and it is Allie who discovers the truth of the mystery and Boston Bill, who’s been claiming his innocence since his trial. Cole’s common law wife, Allie, is attracted to Hitch and it’s obvious to everyone, but at the same time, the gallant and sensual hero Hitch is busy trying to piece together the puzzle of the new casino’s bookkeeper, Daphne Angel—beautiful and filled with secrets and lust for the hero and narrator. The characters are developed through their dialogue, even if they are stereotypes. This is a great escape novel that passes time quickly for an airplane ride or beach read. Readers who like depth to the westerns will want to stick with Loren D. Estleman and pass on Robert Knott’s take on Robert B. Parker.